As you know, The Magnificent Seven is one of my favorite films. I saw it randomly in college on AMC then bought the VHS, later the special edition DVD, read the script over at the Margaret Herrick Library, picked up the blu-ray and saw it on the big screen a year or so ago. 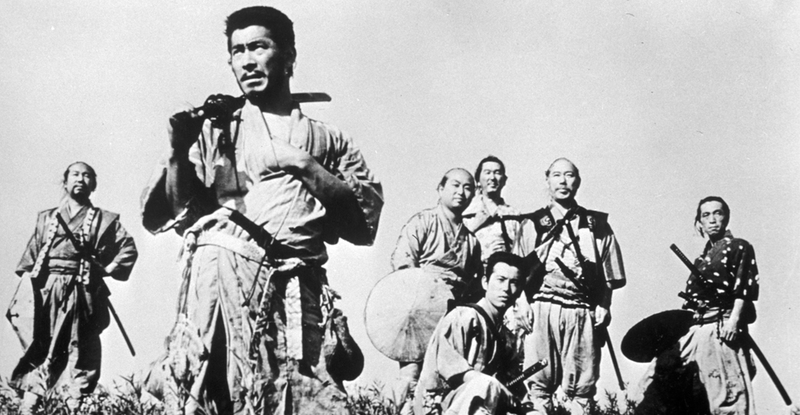 Director John Sturges' remake of Akira Kurosawa's The Seven Samurai is a mix of action, drama, humor and redemption made classic by the cast of Yul Brynner, Steve McQueen, Charles Bronson, Robert Vaughn, James Coburn, Brad Dexter, Horst Buchholz and Eli Wallach set to Elmer Bernstein's epic score. When I heard a remake was on the horizon, I wasn't totally surprised since everything gets remade these days but was thrown by the fact that producers were trying to line up Tom Cruise to headline. That didn't end up happening and in 2014, Training Day helmer Antoine Fuqua and his frequent leading man Denzel Washington were rumored to be stepping in. After Fuqua and Washington's The Equalizer was a hit, Mag 7 picked up steam as current leading man of the week Chris Pratt signed up along with the likes of Ethan Hawke, Byung-hun Lee, Jason Momoa, Vincent D'Onofrio and Peter Sarasgaard. Momoa would end up dropping out but the film moved forward with a script from John Lee Hancock, Richard Wenk and Nic Pizzolatto. 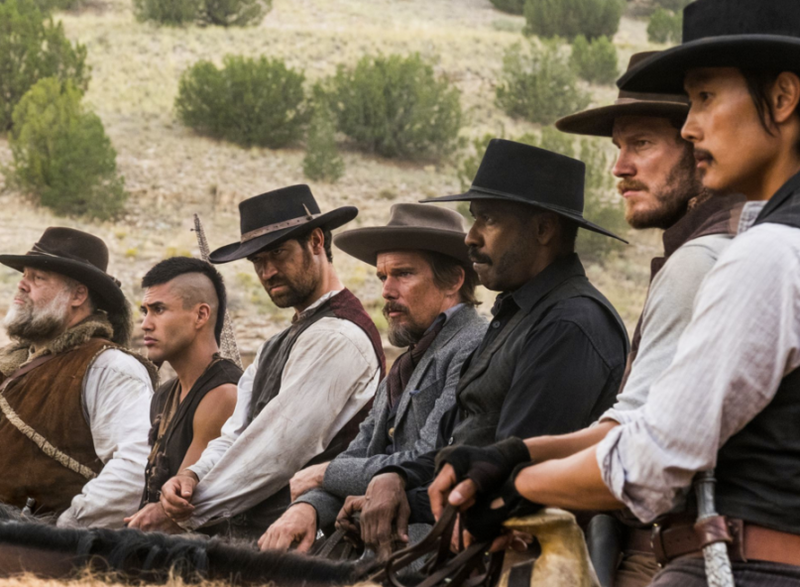 I figured with Fuqua's track record of gritty action flicks like Training Day, Tears of the Sun, Shooter, The Equalizer and Olympus Has Fallen, this version of The Magnificent Seven would be updated to modern times with mercenaries battling a drug cartel along the border somewhere. There was little coverage of the film during production, composer James Horner provided music based off the script before he died, an article with Pratt casually mentions a holster and gun used for training but no photos or reports from the set. That changed pretty quickly this week as stills from the film hit the net early in the week, the dreaded, "teaser of a teaser" followed then the full trailer dropped on Wednesday. Set to House of the Rising Sun by The Animals, Fuqua's version showcases a full on western of long shots, natural vistas, sideburns, hats, gun, knives and explosions. It looks like Peter Sarasgaard's dapper villain and gang of thugs is making things hard for the local folk and a young woman seeks retribution but will settle for revenge. Side burned Denzel rounds up his motley crew, starting with Chris Pratt's liquor swilling, wants to blow something up second in command then quick glimpses of Hawke, Lee and D'Onofrio as part of the team. Fuqua is one of my favorite action directors working today and along with the cast, concept and look, I'm excited for the film. Some might complain about yet another remake but hey, 1960's The Magnificent Seven itself had 3 sequels, a 1998 TV show and dozens of knock offs to it's name. And if anything brings attention to one of my favorite movies from my second favorite era of film; the 1950's and 60's where dudes were macho and physical, I'm all for it. The western has seen a steady stream of low and high budget efforts for the last few decades with Unforgiven, Tombstone and Maverick hitting big in the 90's, revisionist and hybrid versions like Shanghai Noon, Open Range, The Proposition and 3:10 to Yuma in the 2000's, to True Grit, Django Unchained, The Lone Ranger and The Salvation among others in the last five years. 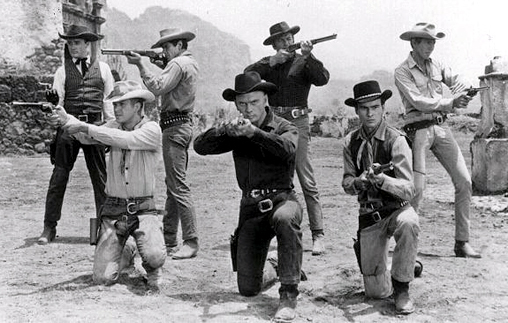 Here's hoping the new Magnificent Seven keeps them coming.